Our range of Single Burner Glass Top Gas Stove helps prepare sandwiches within no time which possesses mouth watering taste. These sandwitch makers are manufactured by the manufacturers in accordance to the industry recommended standards. Therefore, our sandwitch makers are durable and corrosion resistant. 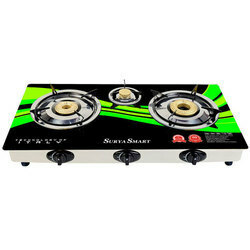 We have been counted amongst the most trusted names in this domain, engaged in offering Glass Top Gas Stove. Due to the increasing demands of our clients, we are engaged in dealing an extensive range of Glass Gas Stove all over the country. The Glass Gas Stove we offer is well designed and highly demanded by our clients. Since our inception, we are engaged in trading, supplying, wholesaling, importing and distributing high-grade Glass Top Gas Stove. All these products are widely demanded by several homes, restaurants and hotels for preparing food. Our offered stoves are procured from the authorized manufacturers of the market.